A rich and highly moisturising and nourishing formula is designed for the care of dry to very dry skin types experiencing temporary and/or long-lasting dryness. It restores the correct level of moisture in the skin, regenerates and nourishes it while improving its elasticity and reducing wrinkles caused by dryness. Dry to very dry skin experiencing temporary and/or persistent dryness, regardless of age. Wrinkles and sagging caused by low moisture levels. With very dry skin types apply the formula every night. In cases of dry skin types and/or experiencing temporary dryness apply 3 times a week as a night mask. Avoid contact with mucous membranes. 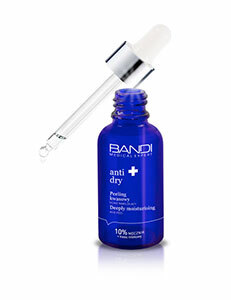 For best results use with other ANTI-DRY line products.